Virions consist of an envelope, a core, and an internal lipid membrane associated with the inner particle. Virion can be bacilliform, ovoidal or allantoid in shape, mesuring about 130 nm in diameter, by 200-400 nm in length. Contains at least 15 different proteins. Circular, dsDNA genome of 156-186 kb. The genome contains two tandem of inverted repeats. Encode for up to 180 open reading frames. Attachment of the viral proteins to host receptors mediates endocytosis of the virus into the host cell. 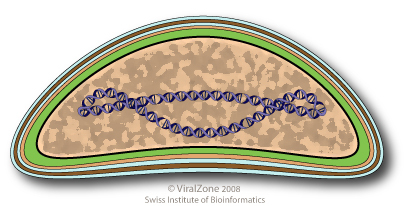 Fusion with the plasma membrane occurs; and the viral DNA is released into the nucleus. Cell nucleus enlarges and ruptures. Assembly of new virions in the cytoplasm. Host cell is cleaved in cluster of virion-containing vesicles. ETYMOLOGY Asco: from greek, “sac”. Referring to the vesicles enclosing large numbers of virions, that are produced by cleavage of host cells. CELL TROPISM TnAV, HvAV, DpAV: most host tissues. ASSOCIATED DISEASES Lethal disease in larvae; impairment of development. The Spodoptera frugiperda ascovirus encodes a viral caspase that is able to induce apoptosis in insect cells.